You are here: Home>Police ancestors>Impersonating a policeman? In early 1878 my second great aunt Ellen Caroline Alexander married George Charles Peters. The birth of their first child a daughter, was registered twelve months later and a son followed mid 1880. 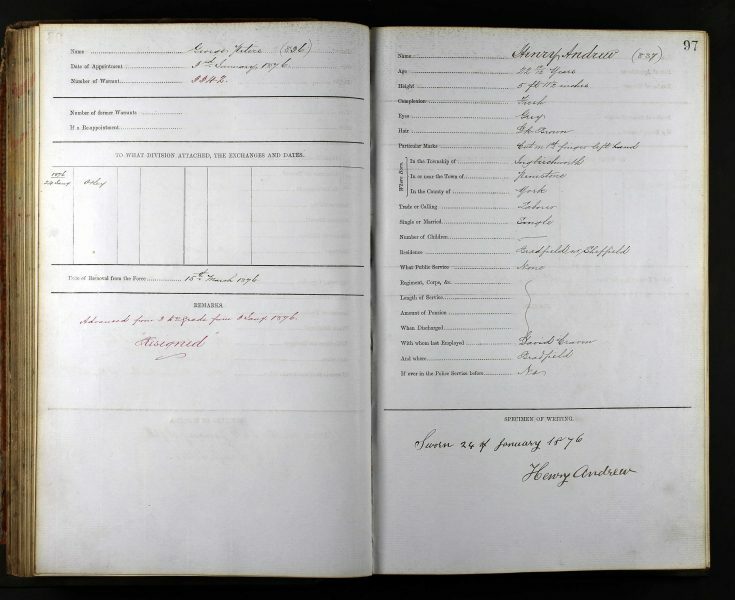 Both children were baptised at Birmingham St Thomas and on both baptisms the address is given as Holloway Head and fathers occupation as Policeman. In the 1871 census he is shown as their son age 14 and working as a green grocer. 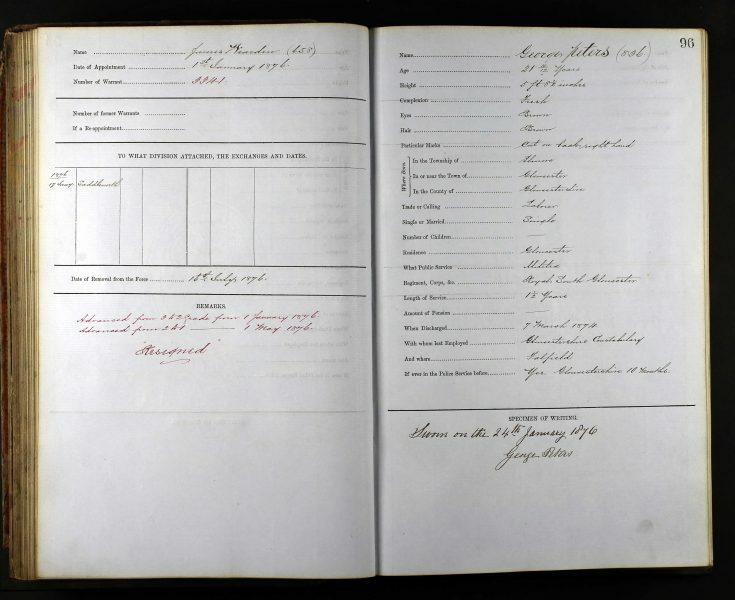 The only police record I have turned up so far is with the West Riding Constabulary where he was sworn on 24th January 1876. He appears as George Peters (836) 21 4/12 years (?) and says he was born Elmore, Gloucestershire and was a labourer. Further he claims to have served with Royal South Gloucester Militia for 1 1/2 years and was discharged 7 March 1874. He says he was last employed by Gloucestershire Constabulary at Falfield and was there for ten months. He served at Otley from 24 Sep 1876 until removed from force 15 March 1876 (contradiction here?) His entry is terminated “Resigned”. This implies he was not a policemen when he married and had his two children baptised unless he had by then joined the Birmingham police? I now see that you have a record for a police officer George Peters of similar age but born some 20+ miles away from Elmore and previous occupation a gardener and that he served until 1890. I found that on 24 Feb 1880 George C Peters was admitted to an asylum in Birmingham but was then discharged 16 June 1880. He was subsequentley admitted to Gloucester County Lunatic Asylum on 16 August 1880 and detained until his death 23 May 1916. I am intrigued as to whether he was ever a serving office in Gloucestershire or did he assume George Peters identity to get his position in the West Riding? Has anyone any thoughts or information that might add to this story? This page was added on 12/04/2017.